Don't miss out on adding that small touch of elegance to your home with the Churchill one draw cabinet. This simple design allows this stylish piece of furniture to look good throughout your home whether old or new. 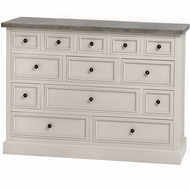 The simple grey ash washed finish provides a subtle and neutral look which would fit perfectly into any style of home.